Many of the world’s fisheries are in trouble - they no longer yield the catches, and potential profits, they once did. The habitats that support fisheries have been damaged by pollution and other irresponsible use of coastal land. Destructive fishing methods like trawling and blast fishing have also changed fish habitats resulting in support of fewer fish. 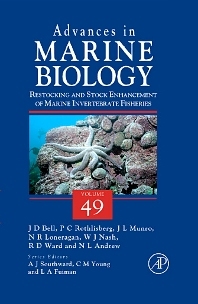 The authors of Restocking and Stock Enhancement of Marine Invertebrate Fisheries draw on more than 1000 scientific papers covering 11 groups/species of marine invertebrates. From this large literature, they distill 20 lessons for assessing and guiding the use of restocking and stock enhancement in the management of invertebrate fisheries.